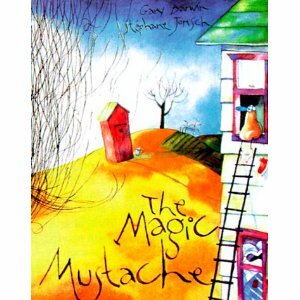 In loving memory of my dad who had, quite possibly, the most debonair mustache on the face of the planet, I offer Gary Barwin’s hilarious book, The Magic Mustache. A wonderfully off-kilter retelling of the Jack of the Beanstalk tale, The Magic Mustache tells the story of a nose who goes to market to trade a pair of glasses for food. In the spirit of the well-intentioned Jack, the nose is talked into trading instead for a magic mustache. (Sounds good to me…I mean, seriously, a magic mustache? I’ll take it!) I don’t know about you, but my two sons can’t seem to leave our local party supply store without spending their allowance on those fake glasses with mustache and nose attached, so this book is quite the favorite around our house. Your kids will delight in the puns, wordplay, silly drawings and overall mayhem that, surprisingly, a nose and mustache can create.